This event in some sense summed up the experience of yet another period in Sergei Diaghilev’s life and activities. His life and activities were tumultuous, emotional, eventful and completely dedicated to Russian and European art. Later, Diaghilev would continue to move in the same direction, albeit choosing different means of influencing the public. He tried not just to publicize Russian culture but also to foster its growth, to introduce Russia to the world. But that would happen later. Meanwhile, at the start of 1905, an irrevocable decision was made to stop publishing the “World of Art” magazine, where Diaghilev was one of the editors. 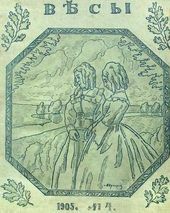 This ending was brought about, gradually, by financial problems and disagreements between the editors. 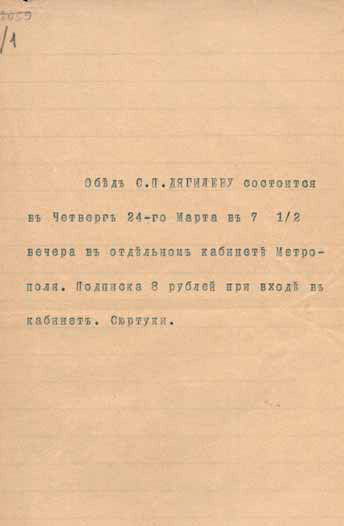 On March 19 1905 Ilya Ostroukhov wrote to Aleksandra Botkina: “Yesterday Diaghilev telephoned from St. Petersburg and summoned me. He said that publication of the ‘World of Art’ was discontinued for good...” Besides, the magazine as such had run out of steam, and the artists and Diaghilev felt they had outgrown a publication of this sort. “...Believe me, this is not because of manque d’argent [money shortage (fr.)] 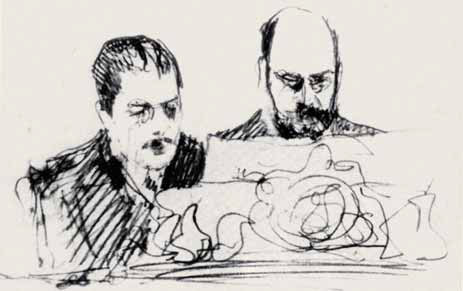 — surely Diaghilev would have found the money — but simply because they had accomplished in this field all they could and had to, whereas thrashing over old straw would be too boring for their energy and for their sympathizers,” Ostroukhov wrote to Botkina. Diaghilev spent several years bringing creative minds together. As early as in 1897 he called on young artists to unite their efforts in order “...to prove that Russian art exists, that it is innovative, original and can contribute a lot of innovations to the history of the arts...” For several years Diaghilev’s entire life was pivoted around the magazine and the exhibitions. Now the publication was folding, and the artists’ association “World of Art” gradually dying off, producing an offshoot — the group “36 Artists”, and later the “Union of Russian Artists”. Diaghilev, however, still continued to organize shows. One of the last exhibitions arranged by Diaghilev became a veritable landmark. This was a history-themed show of Russian portraits at the Taurida Palace in St. Petersburg in 1905. Eager to venture beyond the collections of St. Petersburg palaces and museums, Diaghilev scoured the provinces and came up with about 4,000 portraits. Diaghilev was the official curator of the show, and it became his triumph. Under the impression of this show, Viktor Borisov-Musatov wrote to Valentin Serov: “... All this collection should be left in its entirety at the Taurida Palace, and the Palace would become Europe’s greatest museum of portraiture. This venture bespeaks in Diaghilev a man of genius, and his name would be written in letters of gold in history.” Most people attending the exhibition thought it was a milestone in cultural life. Anna Ostroumova-Lebedeva’s words, “...What a great pleasure for all art lovers!...”, probably best sum up the public impression of the history-themed show of Russian portraits. 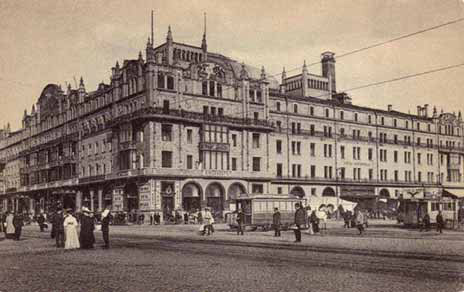 Thus, when Diaghilev’s editorship at the “World of Art” was brought to an end and the grandiose portrait exhibition was opened and won due public recognition, “a company of people appreciative of Diaghilev’s activities... decided to arrange a modest dinner party at the Metropol restaurant”. The organizational matters were handled by Ilya Ostroukhov and Sergei Vinogradov. 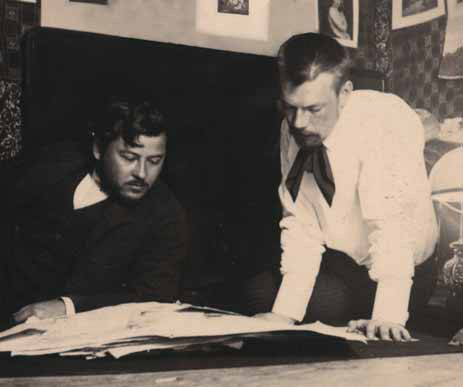 Ostroukov and Diaghilev had been friends for years, although their friendship was not without tensions. 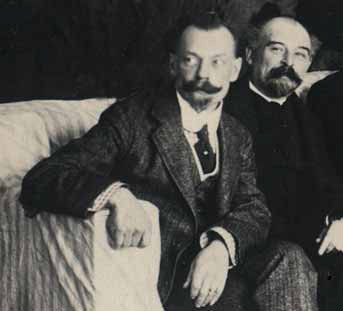 Ostroukhov supported Diaghilev when he was the “World of Art” editor, contributed financially to the magazine, and helped organize exhibitions. 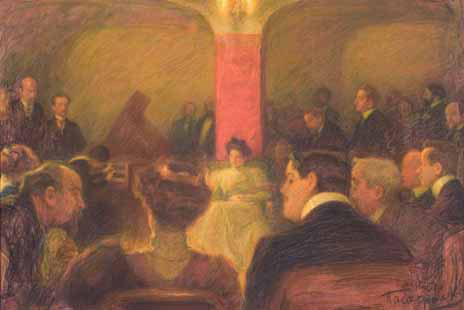 Diaghilev, in turn, took interest in Ostroukhov’s art collecting and closely watched the goings-on at the Tretyakov Gallery, with which Ostroukhov was connected, for he was Pavel Tretyakov’s friend, a member of the Gallery Board for a while and later, in 1905, was elected the Gallery’s trustee. All along Diaghilev shared Ostroukhov’s concern about the Tretyakov Gallery — he believed it was one of Russia’s best museums and, insofar as it was possible for him to do so, worked to ensure the Gallery acquired the best works of Russian artists. Sergei Vinogradov was a landscape painter who had exhibited at the “World of Art” shows since 1901. And although later he became one of the organizers of the groups “36 Artists” and “Union of Russian Artists”, he greatly respected Diaghilev. 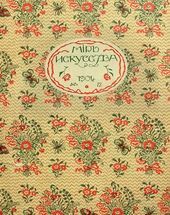 Many artists, including Vinogradov, understood that a major role in their success was played by Diaghilev, who was a connecting link for isolated young artistic minds “...against the rote requirements and views of the obsolescent old guard...”. This is why two persons so different agreed on one thing: the cultural circles of Moscow should express their support and gratitude to Diaghilev for all he had done for Russian culture. “... 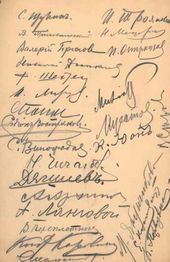 I want to pay a special tribute to him for what he has done and for this amazing exhibition...” , wrote Ostroukhov on March 19 1905 to Botkina. The dinner party was hosted at the Metropol restaurant, recently renovated in the newest style. There were about 30 guests. 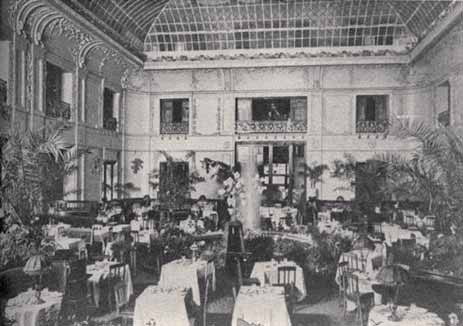 Fine dishes were served: cream of red partridges, Baryatinsky meat soup, Judic filet mignon. The main-course treats included pheasant, grouse, quail, and, of course, there were desserts and coffee. The guests included artists, writers, collectors — in a word, the best and the brightest of Moscow’s cultural milieu of the time. 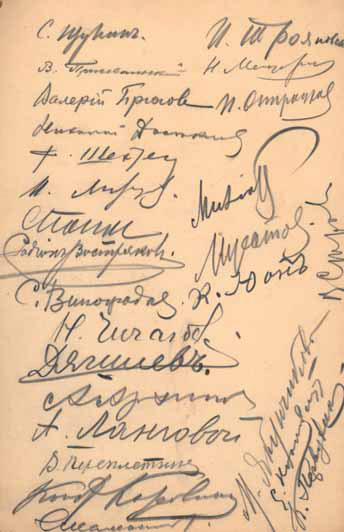 The reverse of the menu, which is held at the Manuscript Department of the Tretyakov Gallery, carries signatures of the guests: Valentin Serov, Ilya Ostroukhov, Savva Mamontov, Sergei Vinogradov, Valery Bryusov, Abram Arkhipov, Ivan Troyanovsky, Viktor Borisov-Musatov, Sergei Shchukin, Konstantin Pervukhin, Vladimir Przhevalsky, Maria Yakunchikova, Fedor Shekhtel and others. These people knew Diaghilev, worked with him, valued and respected him. The guests made toasts, praised Diaghilev, the “World of Art” magazine and the show of Russian portraits at the Taurida Palace. The conversation bore on Russian culture, Diaghilev’s contribution to Russia’s artistic life, the political situation in Russia and its impact on culture. 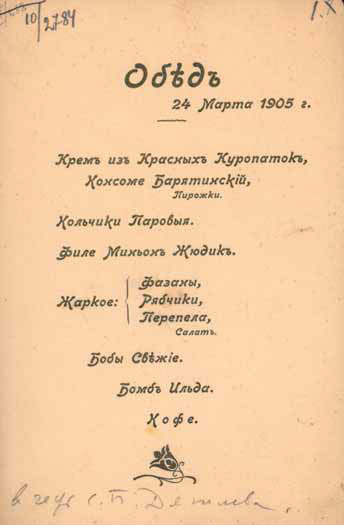 “...Toasts were made by Mamontov, Valery Bryusov, Serov, Dosekin, and me...”, Ostroukhov wrote to Botkina on March 26 1905. In their speeches addressed to Diaghilev the speech-makers emphasized his achievements as the editor and publisher of the “World of Art” magazine and his “glorious exploit — creation of the ‘History-Themed Exhibition of Portraits’, a veritable landmark in the history of Russian art”. Bryusov talked about the “World of Art”’s impact on book publishing in Russia in general. He believed that the magazine was the first book with a truly artistic design. Besides, the closure of the magazine left a gaping hole in Russian journalism. Vasily Perepletchikov in his memoir about the party said that “the conversation, of course, bore all the time on what was going on in Russia” , namely the 1905 riots, which certainly could not be ignored when talking about the contemporary art scene. 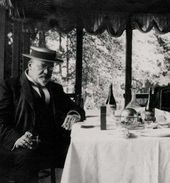 “... Diaghilev was very touched and replied at length...,” reminisced Ostroukhov. “I have enjoyed as much as I have been surprised by the homage rendered to me at this gathering,” said Diaghilev. “When I learned yesterday about the forthcoming gathering, I was greatly excited and felt utterly unprepared to accept such a soul-stirring token of gratitude for what we all together have done, suffered through and won...”. 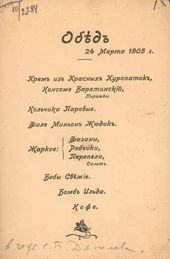 The speech was instantly published in Bryusov’s magazine “Vesy” (Scale) under an appropriate title “At the hour of summing-up”. “Novosti dnya" (News of the Day), March 25, 1905. Manuscript Department of the Tretyakov Gallery, Fund 48, Item 406. Ibid. Fund 11, Item 561. 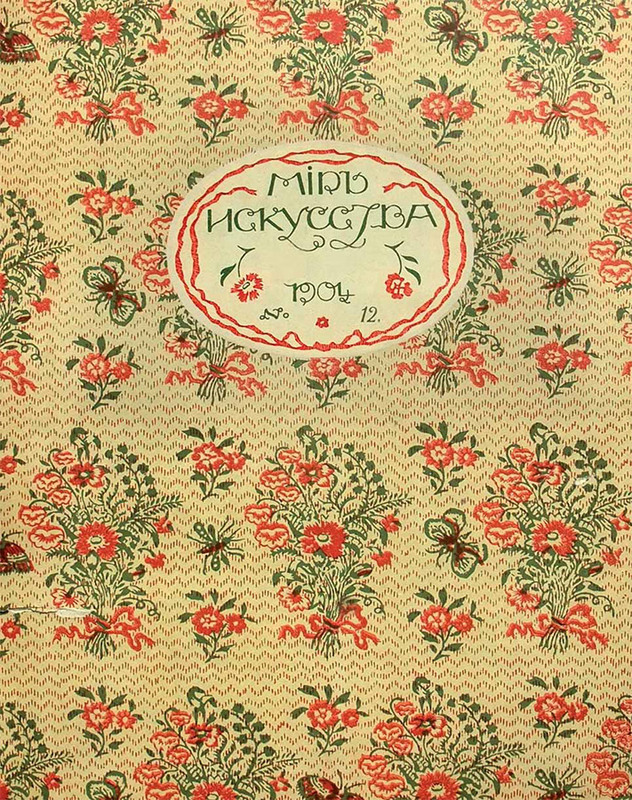 Manuscript Department of the Tretyakov Gallery, Fund 49, Item 121. Ostroumova-Lebedeva, Anna. Autobiographical sketches. 1900-1916. Vol. 2. Leningrad-Moscow. 1945. 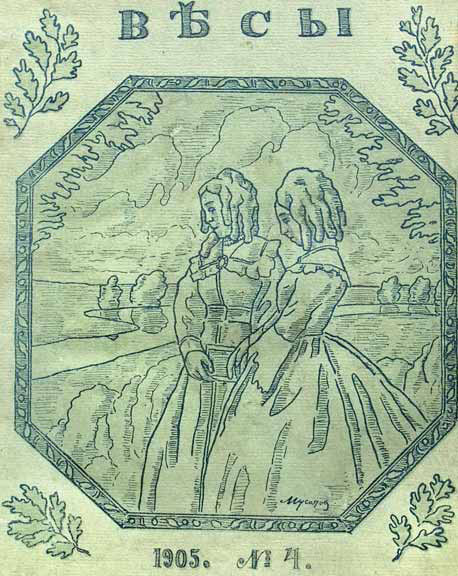 P. 67. 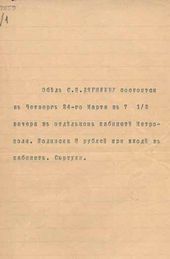 Manuscript Department of the Tretyakov Gallery, Fund 3, Item 201. Manuscript Department of the Tretyakov Gallery, Fund 11, Item 561. Manuscript Department of the Tretyakov Gallery, Fund 48, Item 409. Vesy [Scale], 1905, no. 4, p. 45. Valentin Serov in memoirs, journals and letters of his contemporaries. In 2 volums. Vol. 2. Leningrad, 1971. Pp. 74-75. Sternin, Grigory. Artistic life in Russia at the start of the 20th century. Part II. Moscow, 1976. P. 84. Diaghilev, Sergei. “At the hour of summing-up the experience", Vesy [Scale]. 1905, no. 4, p. 45. Valentin Serov in memoirs, journals and letters of his contemporaries. In 2 volumes. Vol. 2, p. 75. Diaghilev refers to the travels across Russia he undertook collecting items for the portraits show. Vesy [Scale], 1905, no. 4, pp. 45-46. Diaghilev, Sergei. “In defense of art", Rus', 1906, no. 50, 8th March. Lifar, Serge. Diaghilev and with Diaghilev. Paris, 1939. P. 211.